‘Corn on the cob’ is a healthy evening snack and best snack during summer picnics. Easiest way is to boil the corn, while some people might grill or roast it. I prefer the boiling way, but I have mentioned the grill, roast and microwave methods too. Select fresh corn with bright green husks. The kernels should be tight. Frozen corn can also be used. NOTE: Boil corns when it is fresh. Keep the corn with its husk until you boil. Husk the corns just before you boil. For best results, cook corn in a large pot of boiling water until it is tender but not mushy. You can also cut the corn and boil. Frozen corn can also be used. Fill a wide, large vessel with water. The vessel should be big enough to hold the corn. Cover the vessel and bring the water to a boil. Drop the corns gently in boiling water and cook it covered until the water comes to a rolling boil again. The corns would have turned bright yellow by now. Remove the corns with tongs. Do not let the corn sit in the boiling water for long, as it will be overcooked. Corn on cob is usually tender and crunchy. If you prefer softer kernels and easy to chew corn, cook until soft. 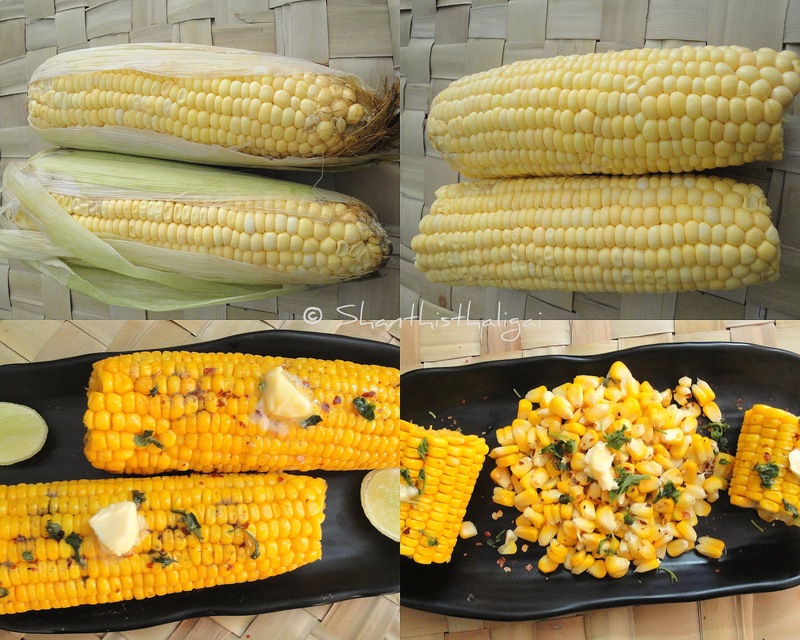 Rub corn with lime and melted butter, sprinkle salt, black pepper powder, chilli flakes and finely chopped cilantro. (You can use any of your favorite spice mixtures , fresh herbs for toppings). Transfer to a serving platter, top with a small cube of butter and serve hot. Microwave high with husk for 3 to 4 minutes . Remove the husk and sprinkle with salt and spice mixtures. Roast over a medium-hot grill, turn with a tong on all sides until the outer husks are charred. When cool enough to handle, remove the husk and sprinkle with salt and spice mixtures. Alternatively, keep the husks intact with the stems. peel the husks backwards, rub oil preferably olive oil, cover back the husks with a string or wrap with an aluminium foil and roast on a grill. When cool enough to handle, remove the husk and sprinkle with salt and spice mixtures.